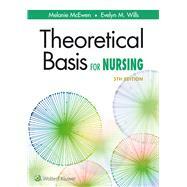 by McEwen, Melanie; Wills, Evelyn M.
Enhance clinical practice with a clear understanding of nursing theory. Access the essential information you need to understand and apply theory in practice, research, education, and administration/management. The most concise and contemporary nursing theory resource available, Theoretical Basis for Nursing, 5th Edition, clarifies the application of theory and helps you become a more confident, well-rounded nurse. This acclaimed text is extensively researched and easy to read, giving you an engaging, approachable guide to developing, analyzing, and evaluating theory in your nursing career. NEW Ethical Theories and Principles chapter familiarizes you with emerging trends in evidence-based, clinically ethical practice. NEW higher education boxes outline important connections with AACN’s “Essentials of Master’s Education” and “Essentials of Doctoral Education” to help you advance your nursing career prospects through additional education. Link to Practice boxes provide concrete examples of how theory guides nursing practice. Case Studies help you apply specific content to common scenarios encountered in everyday practice. Learning Activities test your understanding of key concepts. Chapter Summaries and Key Points recap important chapter content at a glance. Online Literature Assessment Activity and case studies challenge you to think critically about textbook content.